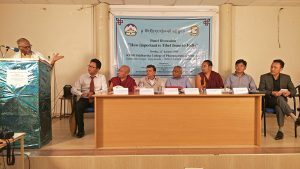 Tibetan Parliament-in-Exile and KVSR Siddhartha College of Pharmaceutical Sciences organized a Panel Discussion on “How important is Tibet Issue to India ” at KVSR Siddhartha College of Pharmaceutical Sciences, Vijayawada on 22 January 2019. The Panel Discussion commenced with welcome and introductory speech by Deputy Speaker Acharya Yeshi Phuntsok. Prof. Srikanth Kondapalli, Professor of Chinese Studies from Centre for East Asian Studies JNU, chaired the panel discussion and briefed about the importance of Tibet issue. Then Lt. Gen PG Kamath, Veteran General Indian Army, talked on impact of Indian Security on Tibet for about 30 minutes, he justified historically, Tibet being an independent nation. He also spoke about the numerous agreements and treaties signed between Tibet and its neighboring countries. Specially, how Tibet was a peaceful country between India and China and historically, there was Indo Tibet border not Indo Chinese border. After the usurpation of Tibet and the war between China and India in 1962, until now border problem between India and China has not been solved and will continue until the issue of Tibet is solved. Therefore, he urged Indian government and public to support Tibet. Lt-Gen PG Kamath was a second highest-ranking officer in Indian Army who has served his entire life for the border security. He is one of the best speakers to speak on Indian Security in today’s time. 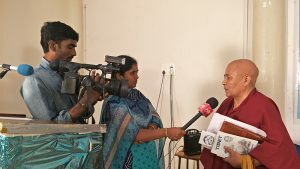 Prof. Srikanth Kondapalli enunciated on Impact of Indian Foreign Policy on Tibet for about 20 minutes, he spoke about the help provided by Indian government for the protection of Tibetan religion and culture from 1959 until now. Like wise, even though helps are provided by Indian government to Tibetan culture centers and institutes for the development and protection of Nalanda’s philosophy and His Holiness the Dalai Lama’s wish but Tibetans are devoid of any opportunity to work in Indian government service sector and buying or selling of land/property. As advised by His Holiness the Dalai Lama, today Central Tibetan Administration is a democratic system where Sikyong and the members of the Parliament are elected by the people. 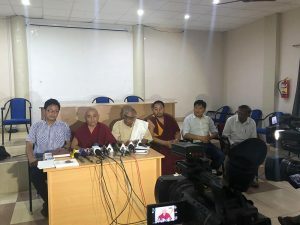 Subsequently, Deputy Speaker Acharya Yeshi Phuntsok spoke on Tibetan culture; the ten Sciences and how Chinese government is destroying Tibetan culture and customs. He elucidated each of these sciences, India being the source of these sciences. Tibetans in exile have been able to protect their culture because of the help provided by Indian government and public and the grace of His Holiness the Dalai Lama but flagrant Chinese policies are destroying Tibetan culture in Tibet and Tibetans are sacrificing their life to protect their culture. Finally, he said that the reason behind organizing this panel discussion is that Tibet issue is equally important to India. After wards, Mr. Tempa Gyaltsen Zamlha from Tibet Policy Institute, Central Tibetan Administration talked on Impact of Tibet’s Environment on India for 28 minutes. He spoke mainly on four sub topics; Tibet is the roof of the world, source of fresh water, third pole of the world and source of Asia’s fresh water. About 1.5 billion people from ten different countries depend on the water flowing from six rivers of Tibet but critical components to Tibet’s ecosystem are undergoing major transformations due to climate change and failed policies of Chinese government. There fore, he requested all the neighboring countries to resist the Chinese policies and endeavor to sign agreement regarding water of Tibet in future. Followed by question and answer session and discussion for 30 minutes, chair of the panel discussion Prof. Srikanth Kondapalli remarked the event and Prof. G.S Murthy from Vishakhapatnam concluded with vote of Thanks speech. In his speech, he appreciated the TPiE’s committee for organizing the panel discussion and requested organizing similar panel discussions in future. Finally, the Deputy speaker presented scarfs and honored the participants. They also distributed books related to Tibet policy published by TPiE and DIIR. Panel Discussion was attended by 100 participants including scholars from Vijayawada, researchers, students, reporters and parliamentary members Ven. Khenpo kada Ngodup Sonam, Ngawang Tharpa Gewatsang, Dhundup Tashi and P.A Kalsang Youdon. 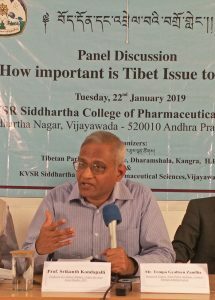 On 21 January, KVSR Siddhartha College of Pharmaceutical Sciences hold a press conference, in which the Deputy Speaker and Prof. G.S Murthy answered the questions raised by about 40 reporters regarding the Panel Discussion and its objectives. Deputy Speaker answering the reporters.